The world may have gone to hell, but ol’ Jack Burton is in his own personal heaven, spending the literal end of days in the last remaining refuge on god's green earth...Florida. The apocalypse is easy livin’ when you have all the cold beer you want. But when his old nemesis David Lo-Pan reaches out to Jack for help, he’ll have to dust off and gas up the Pork-Chop Express to once again save the world from evil forces. 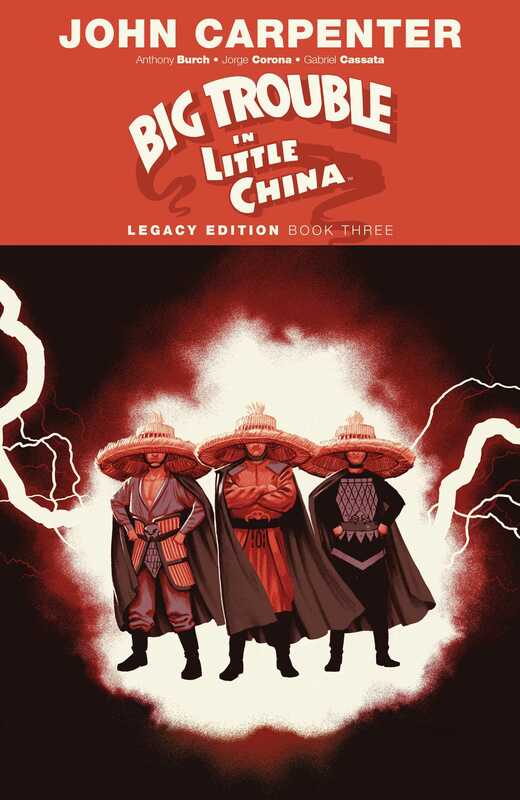 Co-Written by the horror master himself, John Carpenter, along with Anthony Burch (Borderlands 2), and illustrated by Jorge Corona (We Are Robin, The Flash), Big Trouble in Little China: Legacy Edition Book Three collects issues #1-12 of the authorized sequel to the fan-favorite film, originally collected in Big Trouble in Little China: Old Man Jack Volumes 1-3. Legacy Editions collect every issue of the most popular BOOM! Studios series in chronological order and in a newly designed, value priced format for the very first time.